I've finished two pair so far this month. 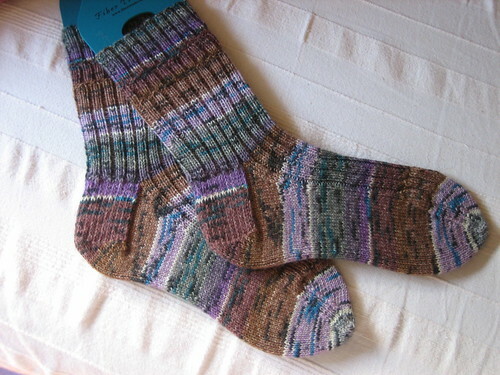 These were done in Fortissima Colori Mexiko #24 in a basic rib pattern. I wore them this week, and they fit great. I hope they soften a little after the wash. They're a little scratchy. I bought this yarn when I was at Stitches West, so no real stash busting with this one. 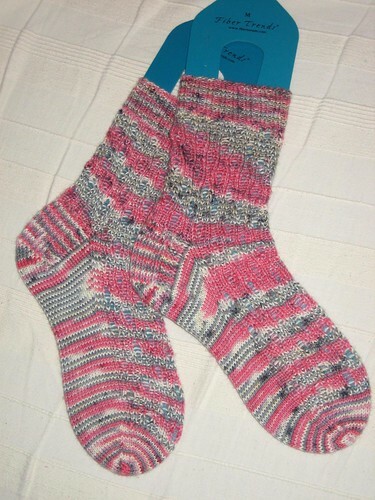 These are Zombie, from Sock Madness 2, Round 1. I used Cosmic Fibers Sweet Transvestite for these. The pattern was great! I'm looking forward to seeing what the next round will bring. I've had this in the "to do" basket for almost a year. I'm glad I held on to it. I know Rocky Horror has little to do with Zombie's, but the floorshow sequence seemed close enough. I post WIP's on Wednesday's and FO's on Friday's on my blog. Come take a look. Very nice! Ahh, Rocky Horror. both pairs looks great. That is an excellent rocky horror name! !